Winterberg Wagyu can be traced to the slopes of the Winterberg Mountains. We live in a unique natural haven in the Eastern Cape of South Africa nourished by pure spring water sources. It’s here, on the Glen Etive farm, that we produce our Wagyu. It’s only recently that we’ve expanded from rearing sheep and cattle to farming Wagyu beef and cut flowers, which we sell locally and abroad.  We started producing full blood Wagyu in 2014, aiming to establish a superior full blood herd using the best genetics available. Our selection process is precise and results in outstanding marbling and premium F1 and full blood carcasses. Winterberg Wagyu is the result of foresight, care and dedication – and the quality and taste of this premium product speaks for itself. Our selection process is precise and results in outstanding marbling and premium F1 and full blood carcasses.